Few people are more qualified than Luis Moya to teach me how to be a rally co-driver. It was Moya’s voice that guided Carlos Sainz to two World Rally Championship (WRC) titles and now, as he explains the basics of how to read a rally stage course, it’s his voice that’s going straight over my head. “This is just like Google Maps. We all know how to use that,” he says. A mistimed handover of the card would result in a penalty – something my driver, two-time world rally champion Marcus Grönholm, might not take so lightly. We’re less than an hour away from my first stint in a 2014 Volkswagen Polo R WRC – part of a four-year lineage of Polo World Rally Cars that came to a close at the final event of 2016 in Australia. Grönholm is best known for being world rally champion in 2000 and 2002, both times driving a Peugeot 206 WRC. 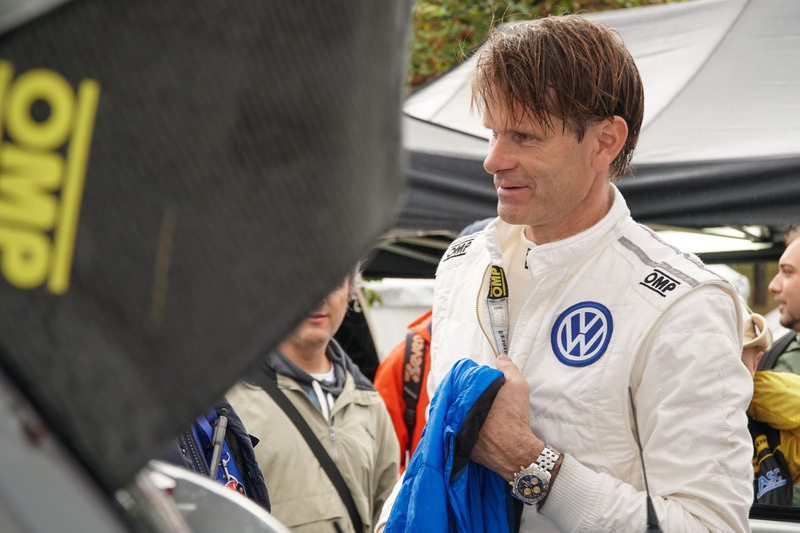 He retired from full time rallying at the end of 2007 – although you wouldn’t know it from the mob of fans following him – and has been working with VW behind the scenes. Today, his job is to drive the Polo at San Marino’s 2016 Rallylegend event, and although his times won’t count in the final result – this is a classic rally, so the two-year-old Polo doesn’t fall into any of the categories – we’re told his pace is blisteringly quick. Moya’s words of encouragement, which have all been spoken in fluent English with a gentle Spanish accent, should be filling me with enthusiasm, but mixing up a flat-out right with a hairpin left is just one of many concerns circulating my cranium. Minutes tick by and one of the mechanics instructs me to get suited up and head over to the car. Nerves make time pass in a blur, and before I know it, straps are being tightened over my shoulders and the low-set bucket seat of the Polo R has wrapped around the edges of my field of vision. The co-driver sits lower in the car than the driver to help with the centre of gravity, so as Grönholm’s slender figure slips into the seat to my left, I have to peer around the edge of the seat’s side protection and look up to see him. My view of the road ahead is narrow, with the dash top located directly ahead, but a co-driver’s job isn’t to look out: it’s to look down at the book. The engineers plug in a laptop and begin the car’s start-up procedure. 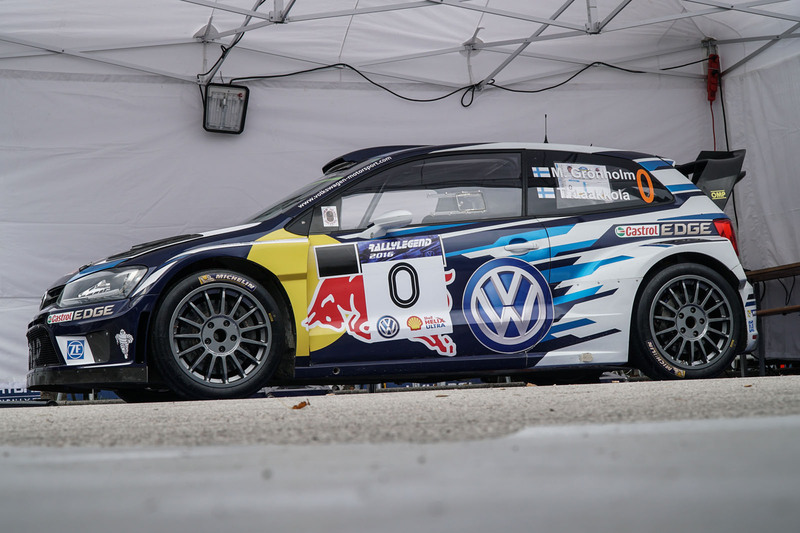 The engine up ahead is a turbocharged 1.6-litre four-cylinder unit that, even with an FIA-spec 33mm restrictor, produces 314bhp and 317lb ft of torque and can surge the Polo to 62mph in 3.9sec. It’s connected to a proper sequential six-speed gearbox and controlled by a pedal box that’s so top secret that we’re banned from photographing it. Lots of buttons are located on the centre console and a digital display offers information for everything from the car’s drive modes to cabin blower settings. For someone who has just jumped into the car for the first time, it’s a bit overwhelming, but the way Grönholm flicks switches and cycles through menus shows it’s just another office for him. Car warmed up, helmet secure and intercom connected, it’s time to face the rally. SS11 is a 4.62km stage called La Ciarulla – The Legend – that circles an industrial estate a short drive from the service park where we start. While I’m carefully directing Grönholm to it, I already begin to sense that his mind isn’t focused on setting the course on fire. The excitement in his voice helps me to release some pressure. Clearly he’s not bothered about stage times; he wants to have fun. The start line marshal grabs our time card through my side window’s slim opening. It’s handed back to me with our start time scribbled on the front, so I check my watch and let Grönholm know that we have two minutes and 30 seconds to go. When there are 30 seconds left, he edges forward to the start line and we wait. “Ten seconds,” I say. His eyes are locked on the start marshal ahead who is counting down with his fingers. Grönholm switches on the anti-lag and pins the throttle. The start marshal’s fingers count ‘two, one’ and we surge forward, wheels spinning and vibrating as they bite into the surface below. “Right around here,” I shout, as he fires up a slight gradient and into the industrial estate. “I think it’s a left here… yeah, there’s a jump ahead, I think.” I’m barely 10 seconds into the stage and my eyes are lost on the page. My head is thrown side to side in the seat and my neck desperately tries to hold my gaze steady. I look across at Grönholm. He’s smiling, arms thrashing at the wheel and right foot prodding at the accelerator. He’s not even listening to me. The guy is just having fun. We launch, the revs dull and, for two seconds, there’s no sound. Then bam! We land flat and Grönholm tugs the vertical handbrake bar to slide us 90deg left around the next corner. I suddenly remember I’m meant to be guiding him, but I’m on the wrong page and he’s too busy showboating for the crowds who line the edges of the road in their hundreds. The spectators are going wild, jumping and leaning forward to feel the rush of air blow over them as we fly past. Dust is thrown up behind the car and the stones scatter into the wheel arches. The engine’s tone is continually changing, so short are the gear ratios and so jagged are Grönholm’s inputs. I put my hands over the road book and forget about it. I’m a rubbish co-driver, but who cares? Four laps of the arena later and Grönholm charges the Polo down the finish lane and we fire past the two red circle signs, signifying we’ve crossed the timing beam. As soon as the engine’s revs dull and the tyre noise dies down, I notice my heart is pounding. The time card is taken from me and then something surreal happens: we pull onto the main road and join regular road traffic. Perhaps shamefully, my only moment to shine comes when I direct Grönholm to the start of the next stage, as he drives at road-legal pace behind buses and MPVs. “You’re a great co-driver,” he says. I laugh, feeling slightly embarrassed about my efforts on the stage, but then I notice a truthful look in his eyes. “Most journalists can’t even direct me along this bit,” he says, smiling. Blimey. Although I sense that Gronholm’s compliments should probably be taken lightly, they still leave me feeling at least slightly useful as we rock up to the start line of the following stage. When the anti-lag next vibrates through the car, there’s no need to look down at the road book. Instead, I let the start marshal count down from 10 and ready myself to watch a master of rallying do his thing from the best seat in the house.